1. 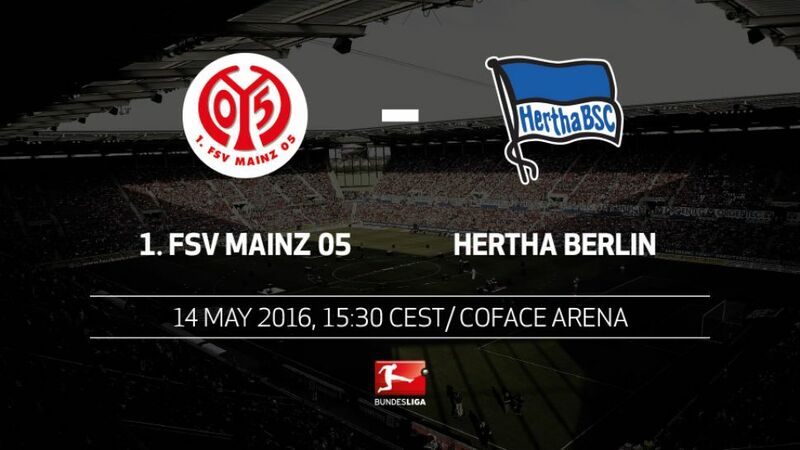 FSV Mainz 05 and Hertha Berlin are both hoping to bypass next season's UEFA Europa League third qualifying round when they go head-to-head at the Coface Arena on Saturday afternoon (kick-off: 15:30CEST/13:30GMT). A loss for either side would see them end the season in seventh in the event that FC Schalke 04 beat TSG 1899 Hoffenheim in their final game. Mainz have the best goal difference of the Europa league sides, and they ended a run of four straight games without a win in beating VfB Stuttgart 3-1 last time out. Hertha's 2-1 loss to SV Darmstadt 98 last weekend was their fourth consecutive defeat and fifth in six games. Pal Dardai's side are without ten-goal Vedad Ibisevic, with the Bosnia-Herzegovina striker picking up his fifth yellow card against the Lilies. Having been in the UEFA Champions League places for 20 weeks this season, a first win since mid-March would at least save the capital club from cutting their summer short for an avoidable round of European qualification. Hertha picked up their third successive Bundesliga win for the first time in two years to end 2015 in third thanks to a 2-0 triumph over Mainz. Mainz have only managed to finish in fifth once before - in the 2010/11 season.Hertha will finish in the top half of the Bundesliga table for the first time since the 2008/09 campaign.Hertha have taken only one point from their previous six games.Hertha won the reverse fixture 2-0. The capital club have never beaten Mainz home and away in a single season. Hertha have lost only once in their seven visits to Mainz, with three victories and three draws.The 05ers have never scored a first-half goal at home to Hertha.